First off– we’re on our way home! Did you miss us? 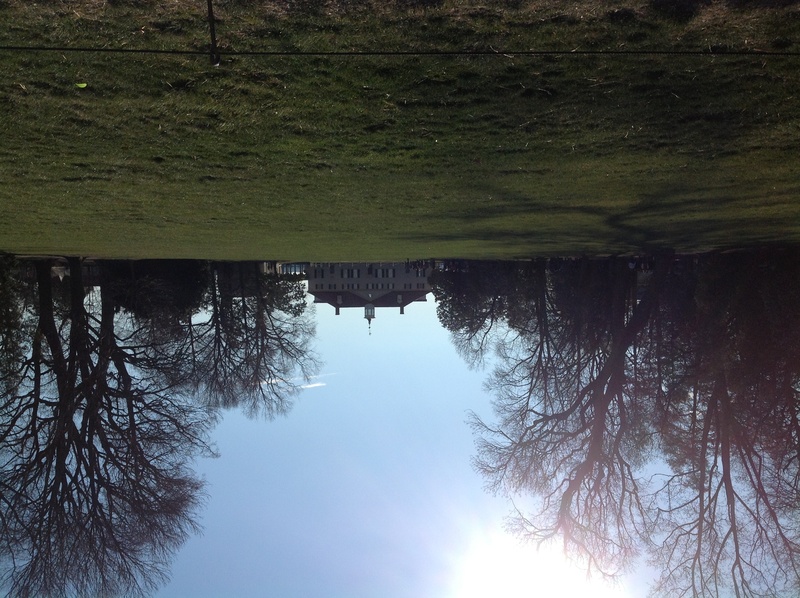 We spent the day a Mount Vernon learning all about our first president. We spent time in his home and got to see the bed in which he passes. However, we were not allowed to take any pictures inside. 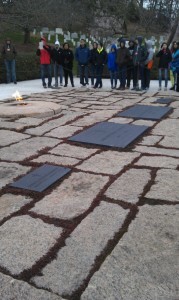 If we braved the cold, we could walk down the hill to his tomb where he, Martha and 29 other family members are buried. 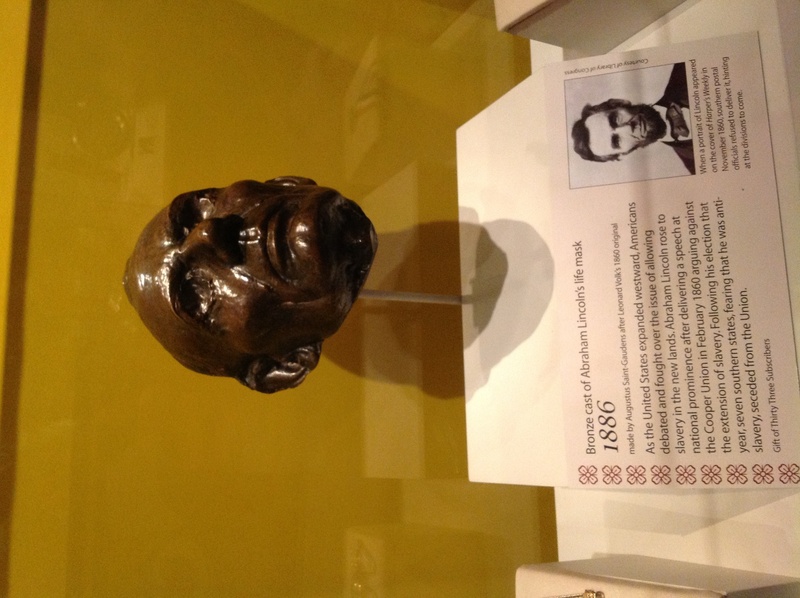 Lastly, we enjoyed the warmth of the inside museum complete with interactive movie and wax replicas of Washinton himself, which are scientifically accurate depictions of what he would have looked like. 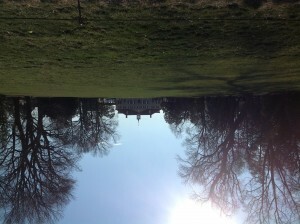 An upside down picture of Washington's mansion. Click on it and it should e right way up. So much information to take in from the day. First off, it was COLD! Probably not as bad as home, but still…expect to hear about that later! Each of the memorials were spectacular. Vietnam reminded us of the shear volume of soldiers who never made it home. Lincoln reminded us that we are one nation, a unit. Korean reminded us that even small wars leave great impressions. 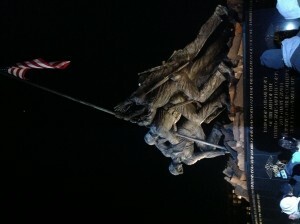 Finally, Iwo Jima reminded us of hope. Our tours were guided tonight, and they were amazing. We learned so much! 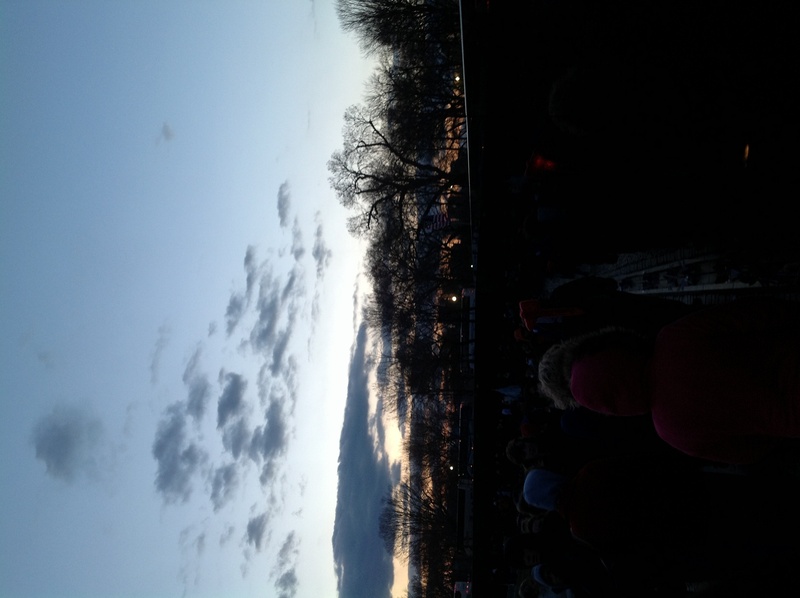 Kind of hard to see, but dusk was turning to evening as we walked along the wall of the Vietnam Memorial. 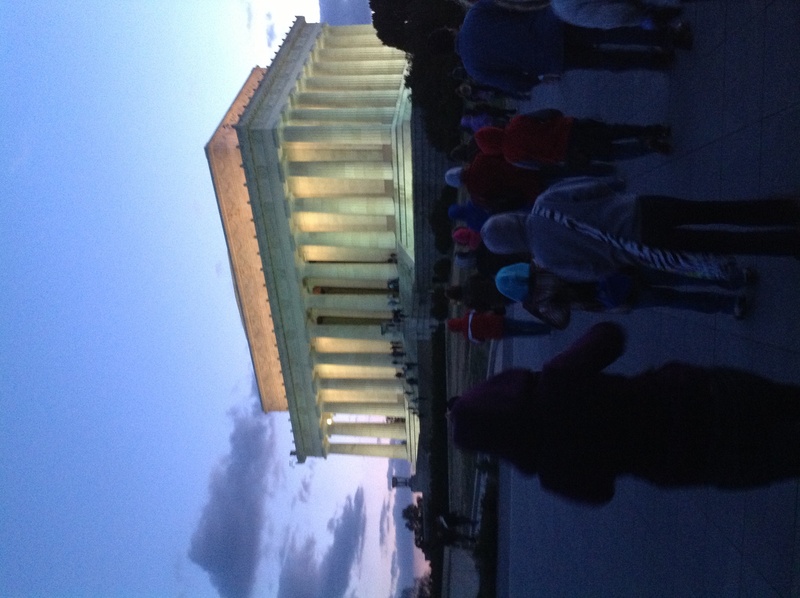 Everyone's favorite: the Lincoln Memorial. 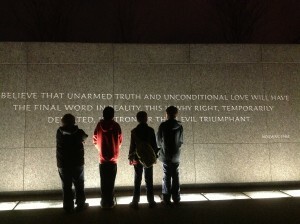 This is where MLK Jr gave his famous speech. "I have a dream..."
The view from Lincoln memorial. 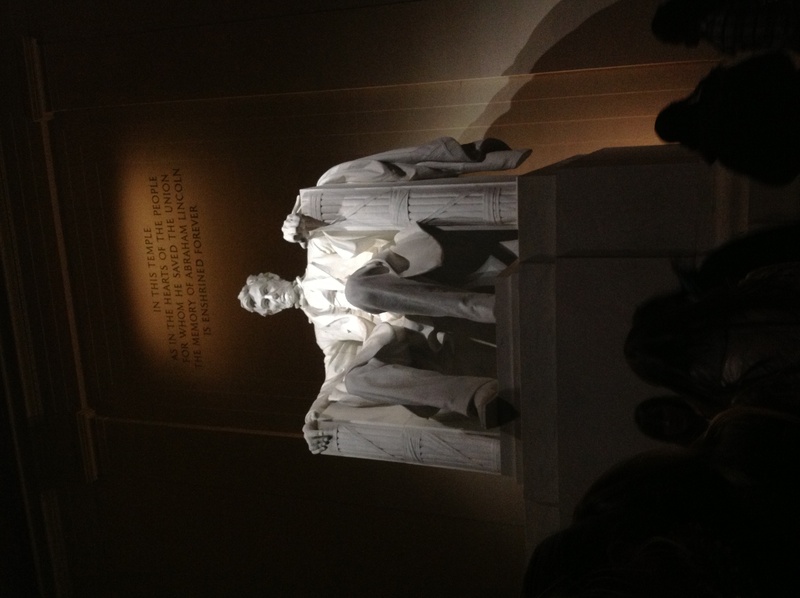 Lincoln himself. Behind him is a quote reminding us what he did for our country: kept it as one. 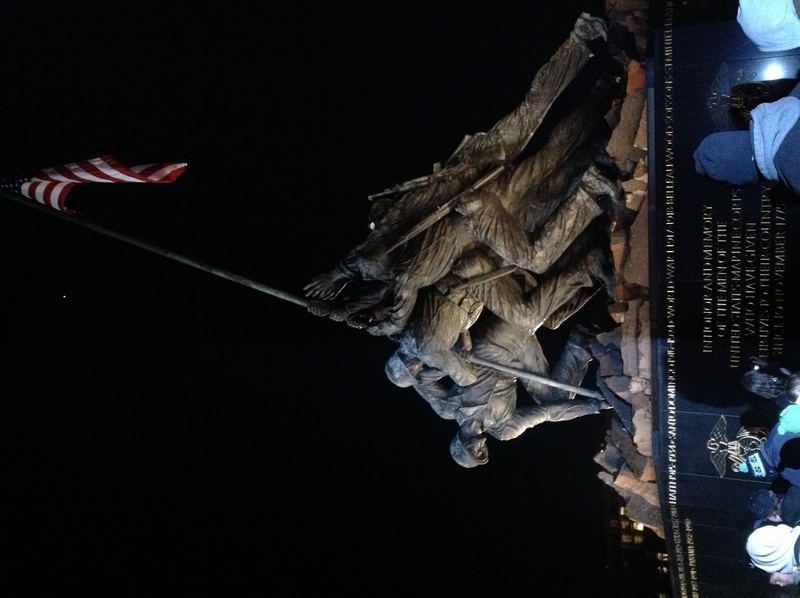 Iwo Jima memorial reminds us of hope because it was the raising of the flag depicted here that inspired our troops when hope wasn't readily available. 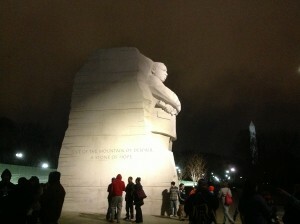 It has said to be one of the most famous pictures. Lack of flash on my iPad, means lack of pictures I the Korean memorial. However, I encourage you to look through them online until we return with more. 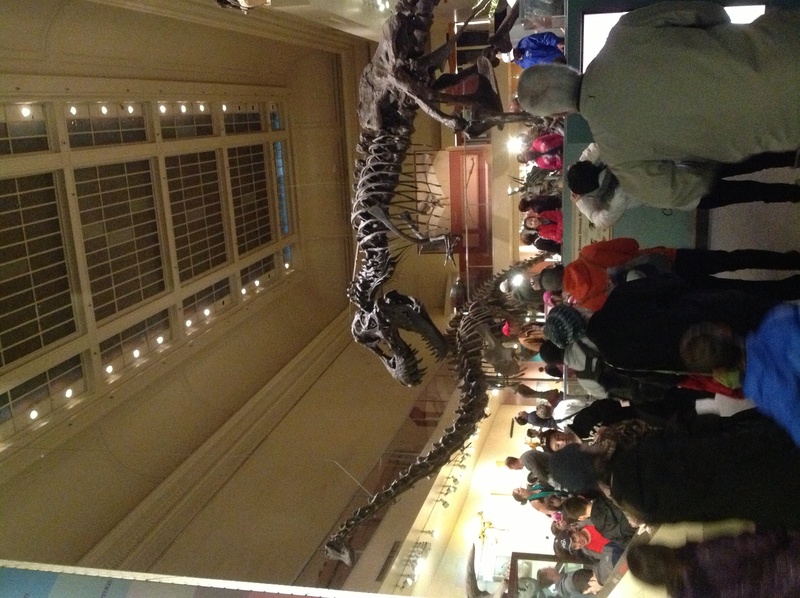 So many museums, so little time! 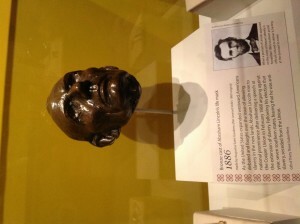 I was able to make it to American History and Natural History. I loved them both! 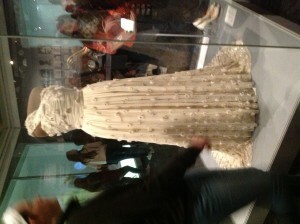 The American History museum had everything from First Ladies dresses to the flag that inspired the star spangled banner. The natural history museum was filled with interesting fossils and even the hope diamond! We ate at Air and Space, and had time to explore. Hope you all are having fun in the snow!! 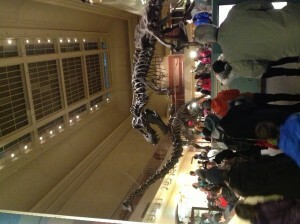 My personal favorite museum: the Natural History Museum! 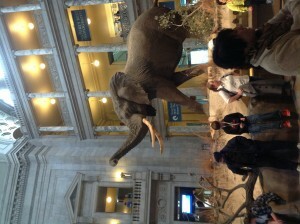 This is the elephant at the entrance. The Inaugural ball dress worn by our current First Lady, Michelle Obama. All of the dresses of the First Lady since Grover Cleveland's wife have been donated to the American History Museum and are on display. Also, I learned that if a flag is flying on either side of the building that means that either the senate or house is in session. 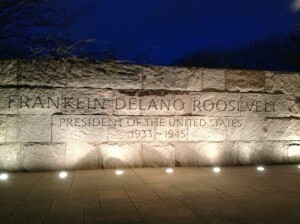 At night this can be seen by the light under Freedom. 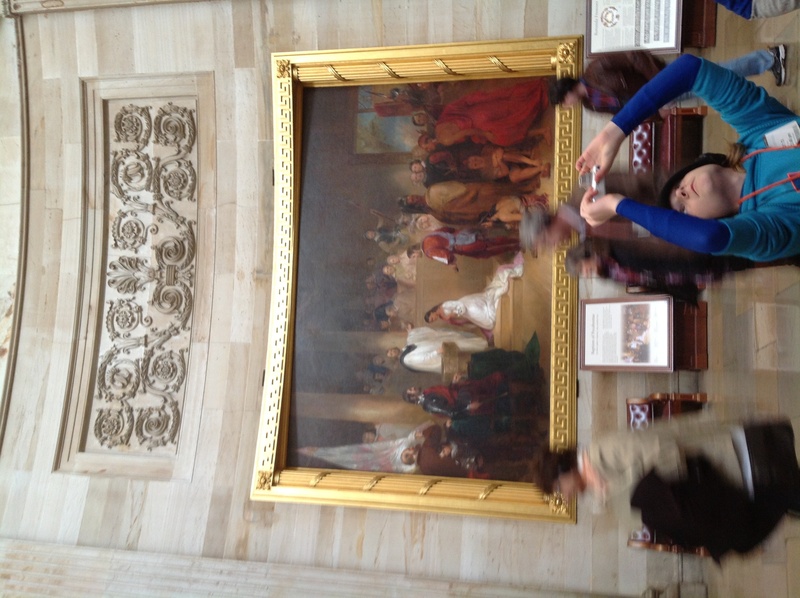 Can you tell if they are in session in my picture? 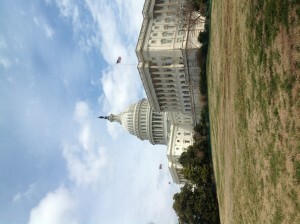 The Capitol building from behind. 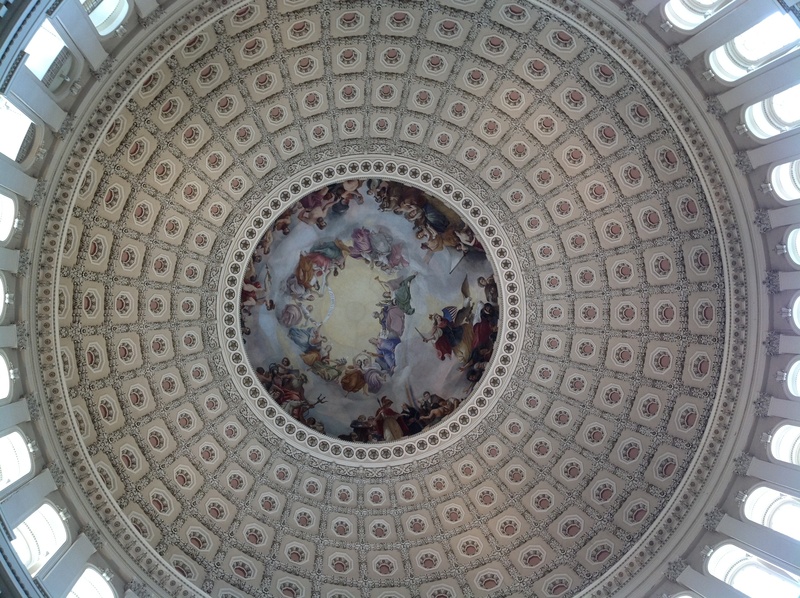 The Rotunda inside of the dome of the Capitol. 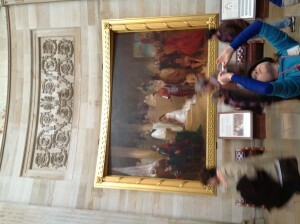 The painting depicts the "Glorification of George Washington"
A painting in the Rotunda of the Capitol. Can you guess what it's showing? So what did you think? Wasn’t Arlington amazing? We can tell you how many soldiers died in war, but until you see the vast stretch of land covered in white headstones does it hit you. 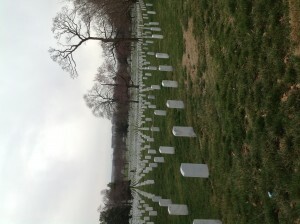 The white tombstones at Arlington. 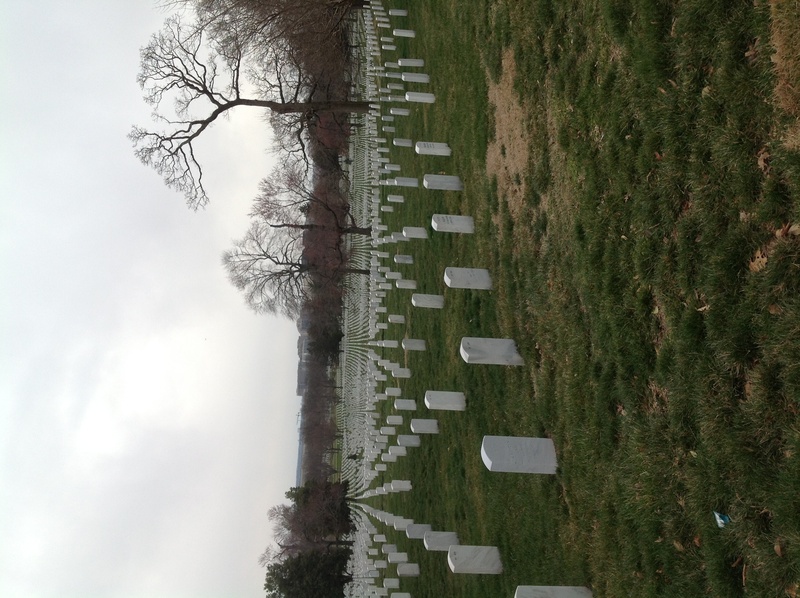 We are on our way to Arlington National Cemetery. We’re going to be seeing the changing of the guards at 9:00 along with the tomb of the unknowns. There we will see 4 tombs representing the unknown soldiers from 4 wars, but only 3 are buried there. The soldier’s identity from Vietnam was discovered thank to DNA testing, but the empty tomb stands as a reminder of those not so lucky. 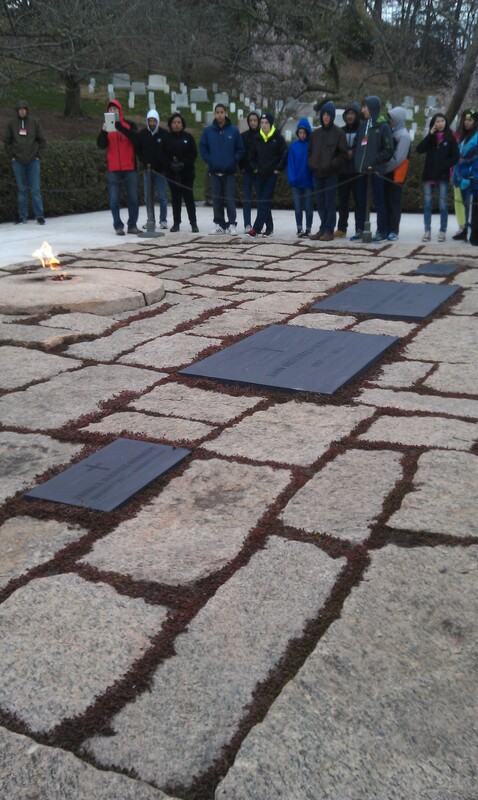 Afterward we will get to see JFK’s eternal flame. 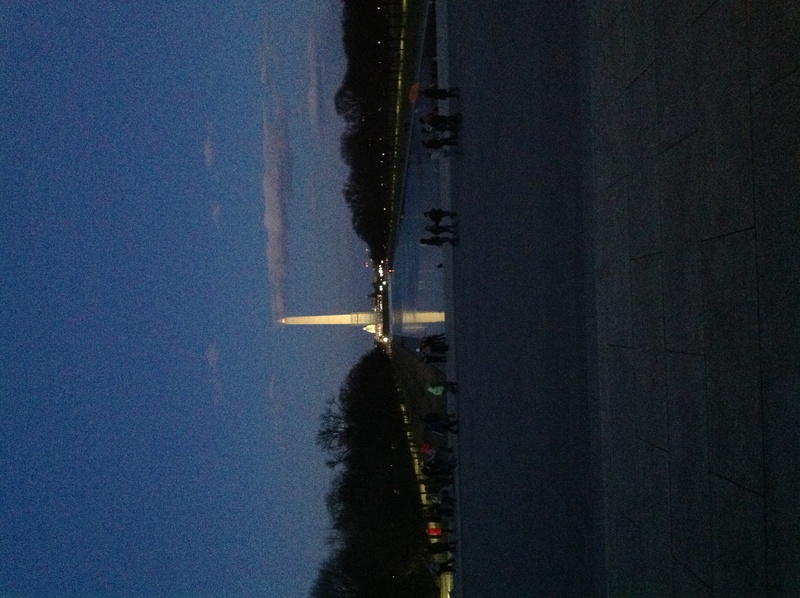 John F. Kennedy once stood on a hill overlooking the Washington monument and said he could stay up there forever. Weeks later, Kennedy was assasintated and was laid to rest in the very spot where he stood weeks earlier. 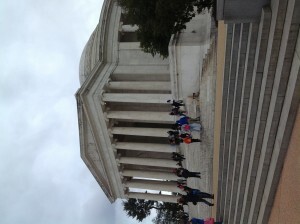 I’ll be posting some pictures of Arlington on our way to the Smithsonian later this morning, so keep an eye out! So much to take in today and we didn’t even get to do everything we planned! A bus had a very minor problem that set us back a few minutes, which caused us to miss Arlington, but we will be going bright and early! We ate at the Marina Cafe, which was great food! Little cold outside (the food warm though!) for our tastes, but we were just thankful to get off of that bus. 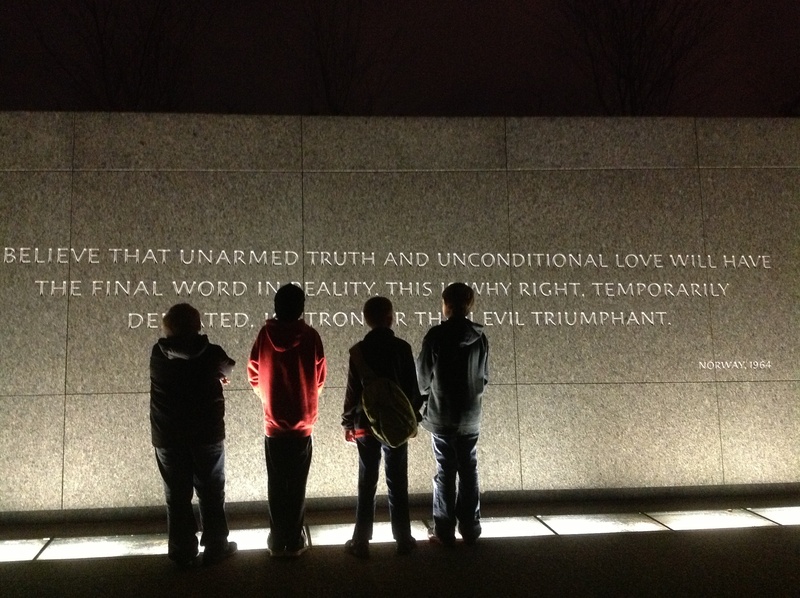 Afterwards we visited the Jefferson memorial, the FDR memorial, and the MLK memorial. All were beautiful, and represented their historical figure well. 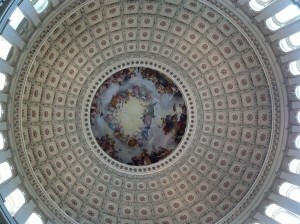 Here are some links to those sites as well as some pictures I took. Safe and sound. There was a bit of trouble with the buses, making us late and have to move the schedule around a bit. So we’re coming up the driveway for Iwo Jima. Pictures soon! Hey guys! I’m testing out the blog for any bugs and since I thought many of you might see, I’d thought I’d remind you to check over the packing lists your teachers sent to make sure you don’t forget anything! Remember, it’s going to be cold! Wear long sleeves under your shirts for Thursday and Friday. Tomorrow it’s wear whatever you want, but remember we will be going to Arlington, so keep that in mind while you pack and prepare for tomorrow. 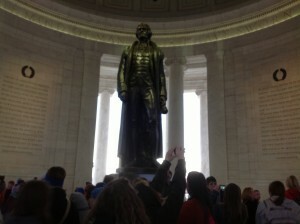 Watch the blog for photos, videos, and updates on our whereabouts. See some of you in the morning!! 5am–bus lot. Don’t be late!